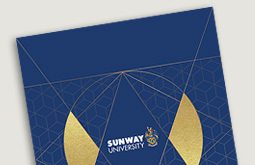 Sunway University is dedicated to championing sustainability within and around campus in the continuous effort to make the world a better and greener place. By instilling sustainable practices into the various aspects of university experience, the University is nurturing a community of socially and ecologically responsible individuals for today and tomorrow. In ensuring high sustainability performance in studying, working and living, Sunway University is assuming a pioneering role not only in managing resources but also in supporting the government in realising the United Nation’s 17 Sustainable Development Goals (SGDs). The following demonstrate the University’s initiatives in building a sustainable future for all. Sunway University is strategically located in Sunway City, Malaysia’s first integrated green township to be certified by the Green Building Index. It is a township which has been recognised as a Top Smart City Initiative in Asia Pacific and an Integrated Smart and Low-Carbon Township by IDC Government Insights in 2017, providing students with the experience of sustainable living in a smart city. Students of the University will benefit from the surrounding green spaces and environment-friendly infrastructure such as elevated canopy walkways, conveniently linked public transportations and bio-diversified theme parks – all of which are situated in a pollution-free area. Sunway University supports sustainability efforts by driving the best minds to discover new ideas in undertaking economic and environmental issues.  The University is proud to be the home of the Jeffrey Sachs Center on Sustainable Development (JSC), established in collaboration between the Jeffrey Cheah Foundation and the United Nations Sustainable Development Solutions Network (SDSN). JSC exists in the capacity to tackle the sustainability agenda through teaching, research, policy and problem-solving practices. As part of the University’s School of Science and Technology, the Research Centre for Carbon Dioxide Capture and Utilisation specialises in the area of carbon dioxide waste conversion to help combat pressing global issues such as global warming. The Research Centre for Nano-Materials and Energy Technology also plays an important role in developing sustainable energy solutions, and focuses on the development of new nanomaterials to optimise renewable energy technology. The University community engages in sustainability culture by participating in various green campaigns held on and off campus. In the biannual e-Waste Disposal Campaign initiative, unwanted large electronics can be placed in a designated waste bin that will be collected for disposal by a certified e-Waste disposal vendor. For smaller electronics such as mobile phones and batteries, e-Waste collection bins are available all year long in strategic locations around campus. Sunway University has also collaborated with NGOs in eco-friendly projects such as the Earth Warriors, in which volunteers join a mass street clean-up to improve and maintain cleanliness of public spaces. iLabs will be hosting a Green Talks series until December 2019 on the following topics: sustainable hotels, sustainable facilities and building management, sustainable interior design, sustainable construction and architecture, sustainable manufacturing and industrial operations, ethical consumerism, sustainable supply-chain management, sustainable landscaping, and sustainable food manufacturing. All talks are from 8:30am to 12:30pm, and attendance is free. More details and event registration can be found at https://www.zureli60.com/green-talks-with-business-malaysia. As part of its ongoing CSR programme, the IT Services Department at Sunway College was happy to collaborate with Rentwise which refurbished the computers and will provide maintenance for the computers. Refurbished computers which are well maintained and serviced perform similar to new computers and are expected to last 3-5 years. The refurbishment of computers is in line with the “no wastage” policy shared by Sunway College and Rentwise, where both organisations aim to uphold green practices for a sustainable future. The joint effort CSR program video between IT Services Sunway College and Rent Wise Malaysia. IT Services have embarked slowly to turn conventional paper notices to electronically information by rolling out TV digital signage for front liner departments. Currently, we have implemented this new digital signage system to Admission Office , Student Life and AUP Office, VUMBA Office. This TV digital signage works with Magic Info software which interface quite user friendly and easy to use. Training was provided to our users to learn how to design content into Magic Info Author and upload to digital signage server to be published out to the TV display. This enable our customers can experience to get more interactive information publicity in one screen with videos, advertising poster awareness and latest campus news. Digital signage will reduce printing and usage of papers which IT Services aiming to uphold green practices for a sustainable future. Together with Office 365 cloud service, Skype for Business has been a new option for user to communicate with each other, especially having simple desktop video conference with partners and colleagues around the globe. Our Managed Print Service contract with Fuji-Xerox has been renewed. We have replaced current printers/Multi-Function Devices with a totally new upgraded fleet. The implementation of online booking systems for various needs has helped to eliminate paper/manual tracking whilst making it more convenientfor users to book a room, facility or an equipment online. IT Services introduced eForms with workflows to help reduce administrative tasks and at the same time going paperless, to adopt a greener approach. 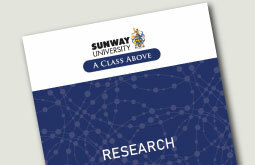 The Sunway MyCampus Mobile App is the official pocket guide to the Sunway Campus in Bandar Sunway. The App delivers news and events related to the campus community. It includes an animated navigation to guide users to find their way around the campus. The app also comes with a staff directory and hotline contacts which is handy. With the app, we will see a reduction in the need to provide physical handouts of news and events, campus location and staff directory listing. Sunway University aspires to become an environmentally conscious campus aligning ourselves with the UN Sustainable Development Goals. With that, the Last Straw Campaign was launched on 13 July 2018. Leading Marine Life conservationist in the country, Dato’ Simon Foong, CEO of Aquaria KLCC agreed to support our efforts and graced the launch alongside our Smart Sustainable Campus Ambassador Dr Elizabeth Lee. #The Last Straw is the overarching theme of the campaign which will see the removal of plastic bottles, plastic containers, plastic bags, plastic utensils as well as plastic straws and any other single use plastic items like Chilli or Ketchup sauce sachets etc. All these will be done in stages to achieve a plastic-free campus by 2020. The first phase of the campaign was to stop water bottles from being sold on campus and through the vending machines. The University then provided additional water stations so students can fill up their water containers. 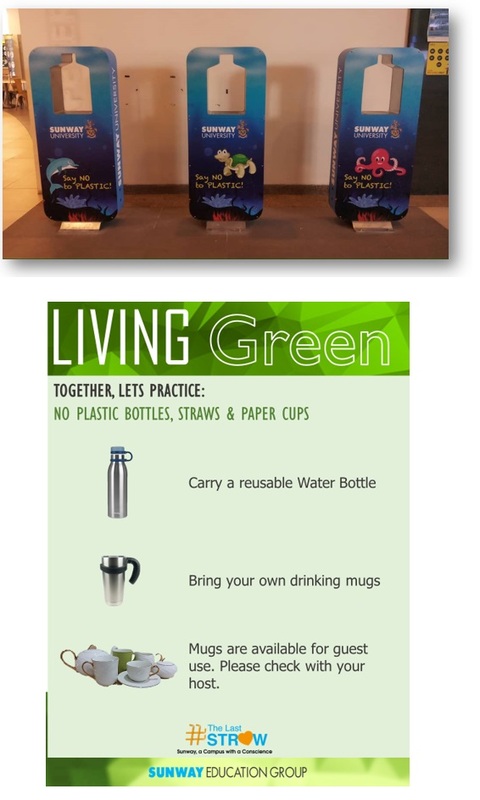 Staff and students were reminded to bring their own mugs and water containers through the “Living Green” poster reminders placed strategically around the campus. The next phase will be to discourage the usage of plastic straw in drinks. From October 2018 onwards, anyone who requests for a straw on campus will have to purchase it. 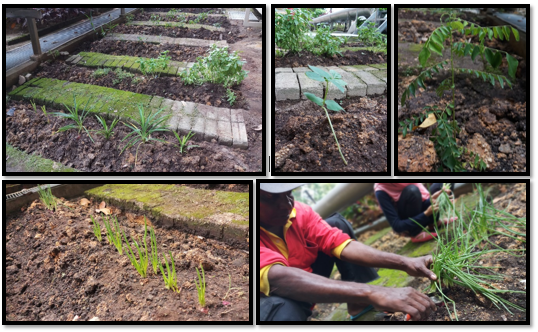 Another Green Initiative is to grow different type of herbs which will be used by the Sunway Le Cordon Bleu, Institute of Culinary Arts as well as the School of Hospitality. IT Services is the first department to implement full LED lighting system for new renovated office. LED lights contain no toxic materials and are 100% recyclable, and will help to reduce carbon footprint. A low-voltage power supply is sufficient for LED illumination. This makes it easy to use LED lighting also in outdoor settings, by connecting an external solar-energy source. A big step towards a greener future! All desktop computers, devices and server devices purchase continue meet appropriate Energy-Star compliance standards for power consumption and support energy-conservation features (Version 6.1 effective September 10 2, 2014). Desktop models deployed will have energy-smart saving mode setting enabled, a simple but effective way of energy-conservation. You will notice your PC going into sleep or hibernation mode after a period of inactivity (such as meetings or short discussion). Leveraging on application virtualization technology, SEG is the first institution to deliver computer lab applications to students’ devices. Students are able to run applications within their own notebook, anytime and anywhere while on campus. The technology eliminate the need for building new labs, which result in saving of RM400,000 of capital expenditure and RM66,000 of yearly electrical cost. The purpose of this campaign was to create awareness amongst the staff and students that a concerted effort was needed to reduce energy consumption . The launch was officiated by the Suruhanjaya Tenaga (ST) – Energy Commission of Malaysia. This initiative is part of the institution’s continuous implementation of energy management programmes to conserve energy and preserve the environment for our future generation. Malaysia enjoys an average of 4 to 6 hours of effective sunlight. As such, solar panels will help reduce the maximum demand for power consumption during the day. 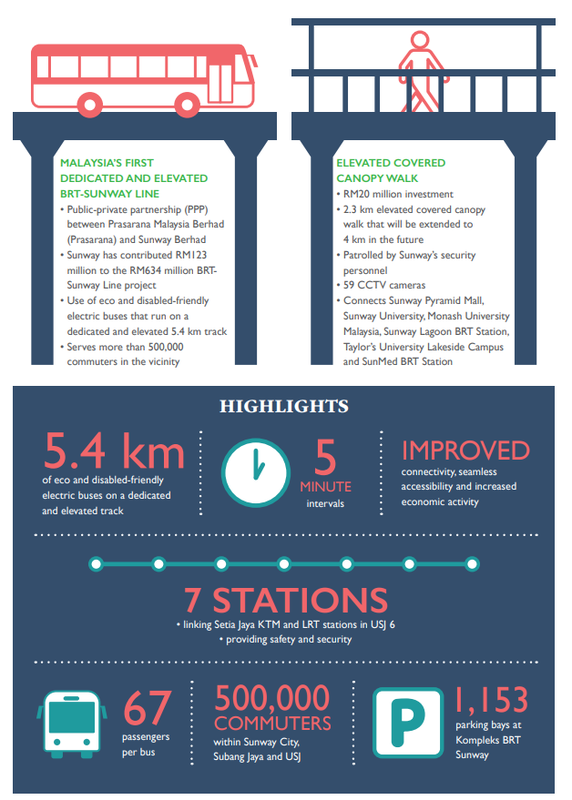 The University as invested over RM2 million with a payback of 6 years. 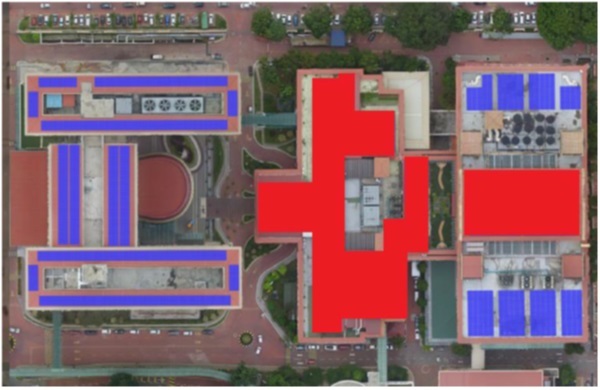 The capacity of the solar system based on the simulation using the PVSyst for Sunway University is 600kWp. The targeted building to use the solar energy is the South Building as their tariff per kWh is range between 0.43 to 0.509 cents. As such, there should be minimal use of electricity for the South Building. Reduces energy consumption in the day time. 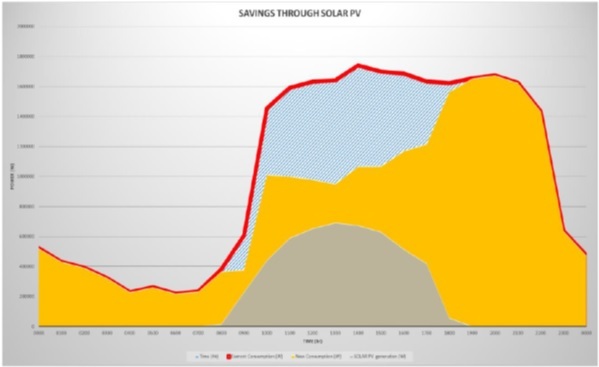 No Saving in MD charges without Battery Storage. The solar panels are installed on the University Building and the North Building rooftops. Batteries 1000KW will be brought in 2 stages in 2019. The campus requires 3500 KW TNB Usage. As such, these batteries will allow us to save further on energy consumption. We hope to achive 11 million Ringgit savings in 30 years. On the “e-Waste Collection Day”, we have e-Waste collection trucks with standby workers to collect your e-Waste at Graduate Centre, you may drive your big e-waste items there and pass to them. This collection service is provided FOC, and there is no monetary return for the collected items. Items collected will be properly disposed in DOE-certified centres. The campus GreenThink! 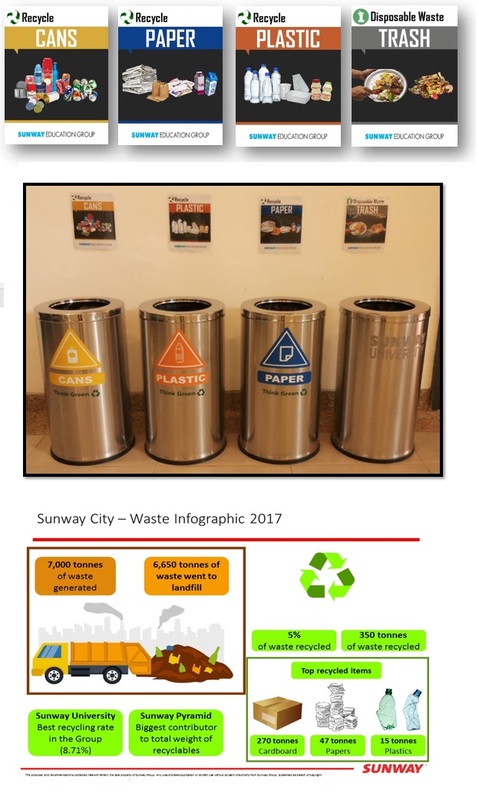 is a venue for Sunway campus community to dispose unwanted electronic devices and electrical home appliances, instead of disposing as regular household rubbish that end up in landfill. Printing e-Waste backdrop wall sticker to stick to pillar wall permanently at new renovated cafeteria and e-Waste bin will be place together so look more incorporate design for promoting e-Waste disposal practice. This design and cafeteria location was approved by Branding BCC and Facilities. An annual initiative by the Sunway Education Group since 2012, e-Waste Disposal Campaign on campus was officially launched on 27th Oct 2016 by Dr Elizabeth Lee, Senior Executive Director of Sunway Education Group. To-date we have collected 21,055.5kg of e-waste, which would have otherwise dump into our landfills. In year 2016 total 2,450.5kg was collected and 623kg in first quarter 2017. Staff and students of Sunway campus can conveniently dispose small e-Waste items such as spoiled mobile phones, batteries, chargers, and other electronic components via e-Waste collection bins placed at strategic locations throughout campus compound. For large household e-Waste items. They can bring in during the twice yearly e-Waste campaign days for the specially arranged disposal truck on campus to be disposed. We ensure a DOE certified vendor, which advocates and supports restoration of the environment in order to preserve a cleaner and greener environment, properly disposes the collected e-Waste. This CSR effort won the “Special Recognition Prize” for #SUNWAYFORGOOD Competition at the 2017 Sunway Leaders Conference. Malaysia's Sunway Education Group has held its latest green initiative is year with 'e-Waste Collection Day' to help increase awareness of the proper way - certified by DOE centres - to dispose unwanted electronic devices and electrical home appliances. Speaking in Kuala Lumpur, the Group's director of IT Services, Tony Lee, said: 'Since its inception Sunway Education Group has collected more than 4,000 kg of e-Waste. Our passion for the environment ensures we remain keen to support innovative ideas that create a better planet. 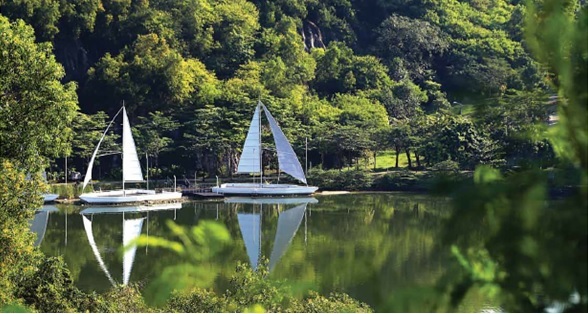 Sunway University has installed alternative pipes that are connected to Sun-Water from the South Quay Lake Water Plant. This state-of-the-art water treatment facility owned by Sunway Group has a targeted portable water capacity of 10 million litres per day (MLD). In case of a water disruption, the University will be able to have its own water supply from this plant. Rainwater Harvesting was implemented in 2017 to reduce constraint on the limited clean water for human consumption. The rainwater is used to water the foliage on the campus grounds. Other initiatives by the Facilities Department include installing hand dryers in the campus restrooms to reduce paper usage and increasing the number of drinking water fountains to reduce usage of disposable water bottles. All buildings within Sunway City are interconnected by an at-grade (pedestrian walk) and elevated pedestrian walkway (Canopy Walk) to encourage walking within the township. Additionally, a dedicated continuous cycling network is scheduled for completion by 2020. Sunway City is currently one of Malaysia’s most connected cities, seamlessly linking the public road network, public transport and the nation’s first elevated Bus Rapid Transit (BRT)-Sunway Line. Eco-friendly electric buses serve seven stations, linking the KTM Komuter rail service and Light Rail Transit (LRT). Commuters can travel to Kuala Lumpur city centre and Kuala Lumpur International Airport with ease. Sunway City also provides a dedicated free shuttle bus service so residents, students and visitors can commute within the township, efficiently. There is ample space for parking bicycles at Sunway Pyramid Mall, Sunway Lagoon, Monash University Malaysia, Sunway Geo and all BRT stations to complete the multi-modal transportation system in Sunway City. 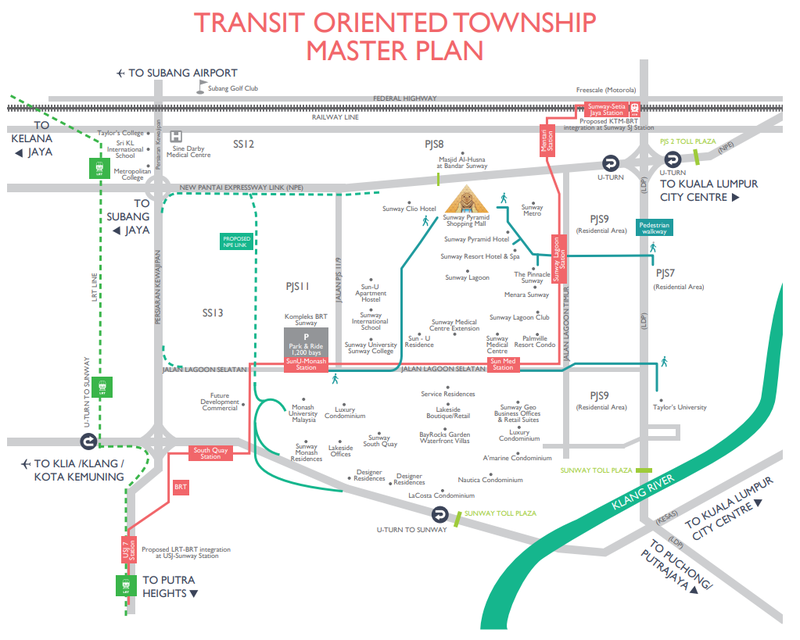 Malaysia’s first transit-oriented township (TOD), with seven key lifestyle components, offers an impressive array of housing, jobs, shops, restaurants and entertainment. Over the years, Sunway has invested more than RM300 million in improving Sunway City’s connectivity, accessibility, landscape and green efforts. This initiative supports Sunway’s growth as a tourist destination and value-generation hub for the nation. As a TOD township, Sunway City is able to focus on development and activities that capture value, which is reinvested in communities and the nation. The University continues to educate its community on waste separation by placing posters next to the recycling bins.